Both Augusta and Bangor campus are equipped with state-of-the-art networking services. 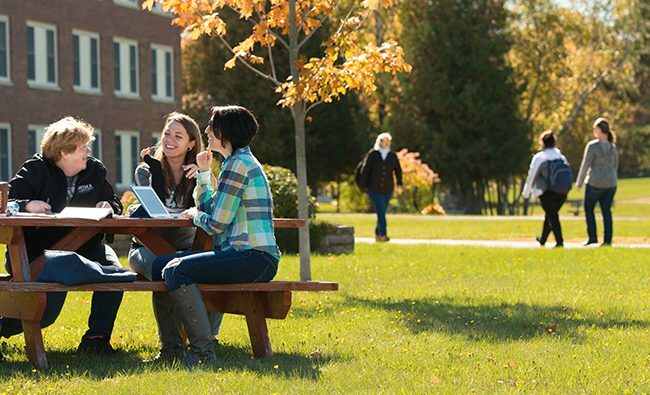 Laptop wireless access (via the “Tempest” network connection while on campus) is available to all who have an active MaineStreet account within the University of Maine System. Authorization to connect wirelessly can be done via a self-registration process. Open a web browser and the self-registration page should open. Enter your MaineStreet ID and password. Please read our section regarding downloading copyrighted material. Both hardware and software may be purchased by students at a discount through Computer Connection, a division of the University of Maine System. Visit them on the web at http://www.umaine.edu/computerconnection or call 207-581-2580 or toll-free at 1-800-261-5543. University students may access their individual university e-mail account anywhere Internet access is available at http://mail.maine.edu. If you have any questions or need assistance, contact a Lab Attendant at 262-7746, or 1-877-UMA-1234 x3475. The student computer labs at the University of Maine at Augusta (UMA) are funded entirely from student-paid technology fees. Because the department of University Technical Support (UTS) and UMA have a responsibility to ensure computer resources are available for currently enrolled, fee-paying students, this policy must be adhered to. The computer labs are resources for University students. The Instructor’s Station and Smart Technology in each classroom is intended for academic use ONLY during classes. Students are to use the computer study lab and follow lab policies when computer use is necessary. It is expected that all lab users will adhere to University behavior standards and norms of common courtesy as stated in the student handbook. Food and drink are NOT allowed near the computer equipment (accidents happen). Please cooperate by leaving food and drinks either at the front of the lab or inside a bag. Lab Assistants have been instructed to ask you to remove all food and drink from computer tables. Violation of any of the UMA student computing policies may result in suspension of account. Use is a privilege not a right. You are expected to exercise responsible, legal, and ethical behavior and to act with discretion when using the userid, equipment, and/or facilities. Interfering with other userids, equipment, and/or facilities can result in loss of privileges. You are expected to cooperate with legitimate requests from UMA staff, and to treat other lab users with dignity and respect. Use of earphones is allowed for sound only (must bring your own pair with you). Voice chat is prohibited. Students are expected to be considerate of other students, and to respect the privacy and confidentiality rights of others. Labs are available for academic uses and students should conduct themselves properly. No socializing is allowed in areas of quiet study. Cell phone use is strictly prohibited. The Unified Fee/Technology Fee is intended to enhance the technology in UMA’s learning environment. This fee covers a portion of the costs associated with the purchase and maintenance of computer hardware, network servers, scanners, Internet Access, software licenses, and specialized, technology-based classroom equipment, such as microscopes. The Unified Fee/Technology Fee is not intended to subsidize the personal use of expendable supplies. Report any unauthorized use of your account to the UTS staff. The user account assigned to you is for your use only. Only registered students of the University of Maine System are allowed to use a student computer. Logging on to more than one computer at any given time will not be allowed. Logging on to let someone else use your ID and password is not allowed. Any wrongful activity originating from your account will result in you being held accountable. Do not share your id or password. The University of Maine at Augusta does not condone and specifically forbids the unauthorized duplication of software . Students are not permitted to install their own copies of any software onto the University of Maine at Augusta machines. Students are not permitted to copy software from University of Maine at Augusta computers or servers and install it on home or any other computers. Accessing or copying files, including printed copy belonging to someone else, is prohibited without permission from the owner. Altering another user’s files or system files without permission, is vandalism and is destruction of University property. System and application files are copyrighted and licensed software. UMA does not block, monitor, or limit access to any web sites based on their content. UMA disclaims any warranty for any information found on the Internet as to its accuracy, authority, timeliness, or usefulness. UMA also disclaims any control over, or knowledge about changes in content to the sources for which it has established links, or for the content of sources accessed through secondary links. Students are expected to be responsible adults while browsing the Web. Inappropriate behavior that interferes with another student’s work will not be tolerated. Report security flaws. All multi-user systems have security flaws. The acceptable, ethical course of action when you discover a security flaw is to report it to the UTS staff. If you wish to help the UTS staff track down the flaw(s), contact them and volunteer your services. Unacceptable behavior has an adverse effect on the work of others, on the ability of UMA staff to provide good service, and on information resources themselves. It is expected that users of all labs at UMA will be responsive to others’ complaints and receptive to UMA staff reasonable requests for changes in behavior or action. University Technology Services staff will attempt to resolve differences and problems among lab users by asking for the cooperation of those involved, and for compliance with UMA policies. UTS staff will pursue misconduct that cannot be resolved informally with the general means it has available within the University and with law enforcement, as appropriate. Protect yourself by learning which downloads are legal, which ones aren’t, and the consequences that come with illegal downloading. Is uploading from a CD that you own onto an Internet site for other users to download a violation of copyright law? Yes. Owning a CD means you own one copy of the music, and the U.S. record industry believes you should be able to make whatever personal use you choose. For example, you may make a compilation recording (on tape or on a CD) to use in the car or while exercising. But it’s a very different matter – and clearly neither legal nor fair – to make a copy of that CD or even one song available on the Internet for others to take. The sound recording copyright holders own the music itself, and have a number of rights under current federal law that include the right to control the reproduction, distribution, adaptation, and various digital transmissions of their works. Therefore, creating unauthorized MP3 sites by copying sound recordings to a server for other people to download and/or offering such recordings for download is a violation of copyright law. Making tapes or CDs of recordings downloaded from the Internet without permission from the copyright owner is a violation of copyright law. Read more about copyright law. Is it within my First Amendment right to post recordings to my site for other people to download? Yes. The question of whether or not you are charging does not impact the answer to whether or not you are violating copyright law. If you don’t hold the copyright, you can’t sell or even give away unauthorized copies of the sound recording without permission. In addition, the No Electronic Theft (“NET”) Act, which amended Section 506 of the Copyright Act, clarified that even if a site barters or trades infringing materials and doesn’t charge or otherwise make a profit there still may even be criminal liability. Additionally, you may face civil liability, including statutory damages of up to $150,000 per copyright infringement, even if you’re just giving away the files. A vigorous program of accepting and responding to DMCA notices. We send an electronic newsletter to all registered students every semester, reminding them to know the institution’s policy related to copyright infringement and that copyright infringement may subject them to civil and criminal penalties. In the newsletter, they are given the link to the institution’s webpage that also includes a summary of the penalties for violating Federal copyright law, as well as a description of the institution’s actions that are taken. Every semester, we send an email to all registered students, notifying them of the link to the student handbook. In this email, we highlight specific important policies that students need to know and direct them to the chapter in the student handbook pertaining to copyright infringement and that copyright infringement may subject them to civil and criminal penalties. This also has the link to our copyright site. The Digital Millennium Copyright Agent for the University of Maine system requests that the UMA IT staff disable the Internet Protocol (IP) address alleged by the notice to be in violation of federal law. One of the IT staff members researches the request and if applicable, disables the (IP) address assigned to the laptop of the alleged violation and notifies the Director of Computer Services. The Director of Computer Services then notifies the user or responsible party with an email detailing our procedures. The user must bring the laptop in question to the IT department in either Augusta or Bangor so the IT staff can verify the material has been deleted, in order to regain network access. Students are asked to read the UMA copyright site and are warned what happens upon a second offense. Second offenses trigger an automatic referral to the Student Conduct Officer. Ruckus was used until they went out of business on February 6, 2009. The University of Maine at Augusta Copyright Site includes copyright references and links to copyright issues in education. UMA developed our own statements.